Preface (R.J. Sturgeon). OMannosylation: a protein modification of lower and higher eucaryotes (W. Tanner, M. Gentzsch, S. Strahl). 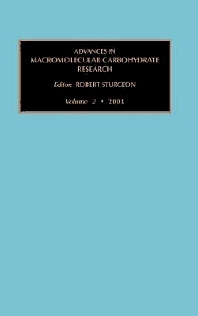 Organisation and construction of the yeast cell wall (F.M. Klis, H. de Nobel). Biosynthesis, structure and conformation of blood group carbohydrate antigens (A. Imberty, C. Breton, R. Oriol, R. Mollicone, S. Pérez). Chitin and chitosan: gathering and regenerating reactions and applications of their reactions (S. Hirano). Glycodendrimers: chemical aspects (S.A. Nepogodiev, J. Fraser Stoddart). In recent years the most significant advances in carbohydrate research have been made in the knowledge of the structure and function of carbohydrates in the macromolecular state. This title addresses those areas in which the authors believe the most important work is being carried out. Successfully deals with significant advances in the understanding of the chemistry, biochemistry and biology of carbohydrates. Comprehensive reviews provided throughout by the authors, in this ever popular field. for carbohydrate and glycoscientists researching the occurrence, modification and biological functionality of macromolecular carbohydrates.